A 4 Bed Four Seasons Private Villa offering all Amenities. Villa Maria was recently constructed, in 2015, with a focus on light, bright interior design. It combines Pacific Coast architectural design with spacious covered terraces, patio areas, private pool and Jacuzzi and provides up to 6,500 sq. ft. of living space. This gorgeous home is situated in a very quiet hillside location overlooking the Pacific Ocean and Marietta islands. Wander onto the main patio to take in sweeping panoramic views and enjoy the breezes. This beautiful home features neutral-toned marble with fun, funky splashes of color and many interesting objects d’art. 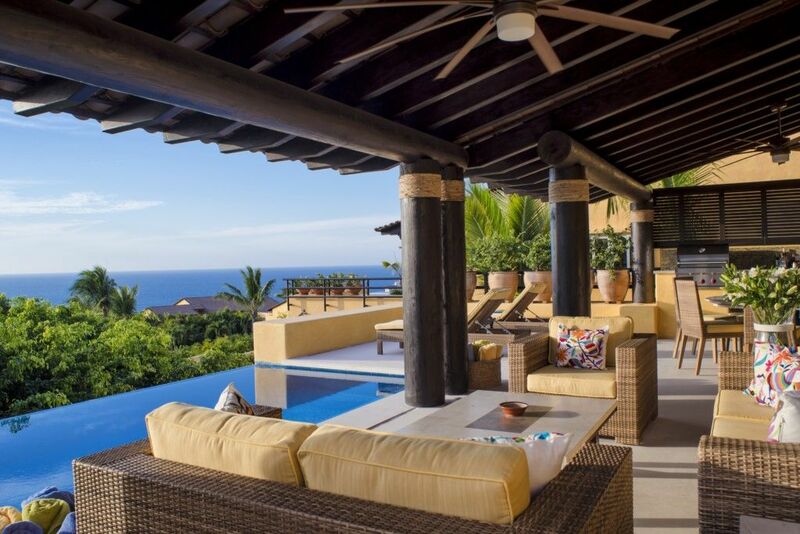 Villa Maria (#53) is a 4-bedroom, 4.5-bath, bi-level, modern Mexican style villa in the exclusive Four Seasons Private Villas community of Punt Mita. The 4 spacious bedrooms offer marble floors and walls, custom cabinetry and contemporary Mexican furniture and artwork. The bathrooms are en-suite with L’Occitaine toiletries. Sleeps 2 – King-size bed. Oversized bi-level room with spacious sitting area, flat-screen TV and walk-in closet. The patio opens out to the Jacuzzi and outdoor lounging area. Oversized en-suite bathroom with indoor and outdoor showers and tub. Sleeps 2 – King-size bed, oversized bi-level room with sitting area, flat-screen TV, walk-in closet and breathtaking views. Large en-suite bathroom with shower and tub. Situated upstairs. Sleeps 4 – Two Queen-size beds, en-suite bathroom with shower. Courtyard views. Sleeps 2 – Queen-size bed, secluded private patio with chairs and garden views. En-suite bathroom with walk-in shower. ALL BEDROOMS INCLUDE FRETTE SHEETS, FOUR SEASONS STANDARD BEDDING AND TOWELS, FLAT SCREEN TV, IPOD DOCKS, BOSE SYSTEM ALARM CLOCKS, DVD PLAYERS, SAFETY DEPOSIT BOXES, L’OCCITAINE TOILETRIES, HAIRDRYERS AND BATHROBES. Comfortable and spacious modern Mexican interior design featuring bright, fun tones, hand-woven Mexican textiles, Mexican ceramics and art. The owner is a long standing member of Punta Mita community with other residences in the area. He wanted the use of his own space but enjoys all The Four Seasons Hotel has to offer too. House manager with personal housekeeper who has worked with him for many years. use of Private residents clubs and all hotel facilities. All bathrooms include safety deposit boxes. L'occitaine toiletries, hairdryers, robes, slippers, and towels. Use of all Four Seasons Hotel facilities means you have access to all that Punta Mita has to offer. Any additional services like chefs, masseurs, yoga instructors, babysitters etc can be arranged. Full daily housekeeping and breakfast service is included in the price. Pre arrival grocery shopping/pantry stocking service is available.